Some golfers talk so much during a round that it annoys their fellow competitors. I well remember a popular, but verbose member at my own Club who had a reputation of constantly chattering throughout his round. One particularly chilly winter’s day, as he reached the warm sanctuary of the locker room, he announced that it was so cold outside that he could hardly speak. A fellow competitor walking close behind him remarked, “Thank goodness for that, I thought I must be going deaf!” Other golfers are so focused on their round that they go out of their way to remain silent, purposely avoiding any small talk with their fellow competitors or opponents. Rule 12-2. If a player believes that a ball at rest might be theirs, but cannot identify it, they may lift the ball for identification. Before doing so, they must announce their intention, mark its position and provide and provide the fellow competitor or opponent an opportunity to observe the lifting and subsequently its replacement. Rule 27-2. If a player chooses to play a provisional ball they must then announce the fact that they are going to play a provisional ball before making a stroke at it. Rule 4-4c. If a player discovers that they are carrying an excess club or clubs, they must immediately declare which club(s) they are taking out of play before making another stroke. Rule 2-5. In match play, if a doubt or dispute arises between the players, a player may make a claim by notifying their opponent that they are making a claim, or are seeking an official ruling, and agree the facts of the situation before commencing play of the next hole. Rule 5-3. 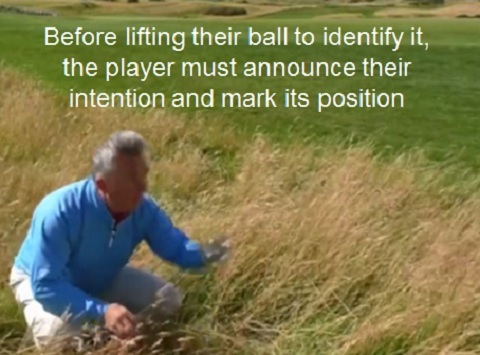 If a player has reason to believe their ball has become unfit for play during play of a hole they must announce their intention, mark the position of the ball, lift and examine it, giving another player the opportunity to observe the lifting, examine the ball and witness its replacement. Decision 20-1/0.7: If a player has reason to believe they are entitled to relief from a condition, for example to check whether their ball is embedded, they may announce their intention to check, mark its position and provide the opportunity for a fellow competitor, or opponent, to observe the lifting and subsequently its replacement (Rule 25-2). There are other occasions where a player has to indicate their intent, but not necessarily using the spoken word, e.g. they would like a ball that they consider may assist a player to be lifted, (Rule 22-1), or require that a ball that has been played out of turn by an opponent be replayed, in turn (Rule 10-1), or making a concession in match play. In these cases a gesture, or an action, is sufficient, providing it cannot be misunderstood, e.g. picking-up an opponent’s ball in play usually signifies concession of their next stroke. (Edit 14th Feb. 2018: But see Decisions 2-4/4 and 2-4/5). Of course there is an occasion where every golfer, whether amateur or professional, should use their voice ensuring that it is heard; that is when they hit an errant shot in the direction of any person, when “FORE” should be shouted, as quickly and as loudly as possible. Thanks for the great response to my call-out for my ‘So You Are Going to Play Match Play!’ eDocument, which now includes a single hand-out page for all match play team members, with 12 essential Rules tips to avoid the opposition taking advantage. If you meant to order, but did not get round to it (! ), you can now do so at this link.